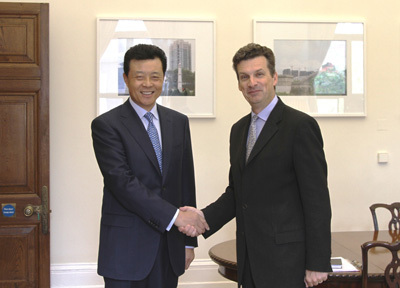 On May 11 2011, Ambassador Liu Xiaoming met with Sir Geoffrey Adams, Director General Political at the Foreign and Commonwealth Office of the UK. Ambassador Liu Xiaoming said that China-UK relationship has gone beyond the bilateral scope and is taking on more strategic and global significance. Cooperation between the two countries in the United Nations affairs, international economic and financial affairs, nuclear non-proliferation, climate change and the Millennium Development Goals holds out great promise. He hoped that the two sides may further strengthen cooperation, work together to promote the development of the comprehensive strategic partnership and contribute to the maintenance and promotion of world peace and prosperity. Sir Geoffrey Adams said that, as permanent members of the United Nations Security Council, the UK and China shoulder important responsibility in handling the cross-border threats facing the international community. The UK attaches importance to china's international role and hopes to stay in close communication with China to jointly respond to various global challenges. The two sides also exchanged views on international and regional issues of common interest.